Home > The Pencil Grip, Inc. The Pencil Grip, Inc.™ is dedicated to providing resources to parents, teachers and therapists that set the standard for excellence in education. The Pencil Grip, Inc™ has grown to offer hundreds of unique and innovative products for the home, school and office. With a scientific approach, The Pencil Grip, Inc.™ has continued to create tools that are designed to stimulate the mind, foster creativity, and are the best available. 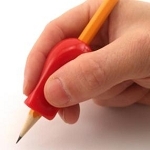 Extra-large, ergonomic writing grips gently support arthritic hands.